As I mentioned in my first Halloween inspiration board early this week (find it here) we are doing a circus theme this year. Since I am already a ringleader one night I wanted to change it up for the next night. So Friday myself and a couple other girls will each be different animals. 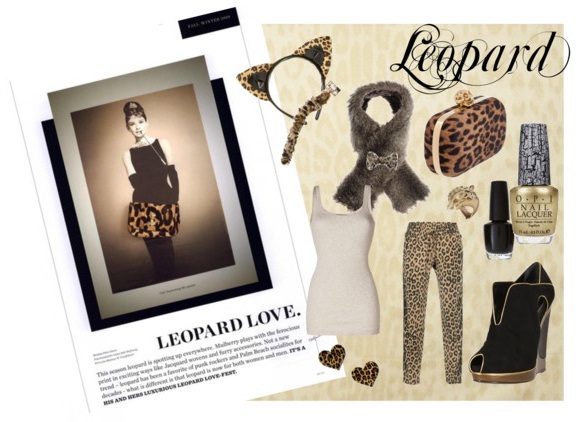 As you already put it together I have chosen to be a leopard. I chose this because I love a good excuse to wear animal print and also have a pair of leopard pants that I love but don't always have the right occasion to wear them. The last time I wore them was at one of last Fall's Toronto Fashion Week after parties (you can see them worn here). I found myself a kit with the ears and tail to match, a set of whiskers and a fur shawl that I will hold together with a leopard print bow I took off a headband. Stay tuned for how the costume turns out as well as one more costume idea I have in store for a night outside of the circus theme.